First Couple Of Weeks At Slippery Winds Lodge. Hi everyone, my name is James Mathias I have taken a job with Slippery Winds this summer. My position here is fishing guide/ shore hand. I have decided to write about some of the adventures that I have had already and will continue throughout the season to write about my experiences here at the lodge. I will begin with a short story about a few day out on the water. Well, I suppose I should back it up just a bit for a moment. This season started off with a good couple of weeks of getting to know the staff here at Slippery Winds. Lori our Manager / Chef, Elizabeth and Paulene, our waitresses and house cleaning staff, Rick our mechanic/maintenance and a bit of everything handyman, Sam, our 2nd guide and shore hand helper, Stormy and Aaron, our helpers that came up just to help open up the lodge for the season, and of course our fearless leader himself Mr Randy Duvell. Getting to know these people over the first few weeks of the summer has been a pleasure. everyone has put in a lot of hard work to get the lodge ready for guests to come and relax on a fishing vacation they will not soon forget. Our first guests arrived on the 19th of May. with cold-front cold wet conditions, the fishing was proving a bit tough to figure out, it wasn’t just our guests either that were finding things tough but our guides too, especially myself, I was finding it very difficult to get even enough fish to have a decent shore lunch. On day 3, two of our guests decided to break down and hire a lodge guide I was the man for the job. I took a fantastic couple of guys from Texas out for the day. In the morning we hooked into several Largemouth and smallmouth bass and then got into a few northern pike. As the walleye decided to go to a bay we didn’t hit yet I had made the decision to keep a few of the smaller pike to keep for shore lunch. Lunch was a hit. The almost traditional Canadian shore lunch which consisted of fried tomato pork beans, canned corn, homemade hash-browns, fried onions and, well, in this case instead of walleye it was northern pike seasoned with the slippery Winds top secret seasoning and properly filleted and deep fried over an open fire in the pouring rain. Our clients seemed very happy with the day as they hooked more fish than they were expecting by days end. 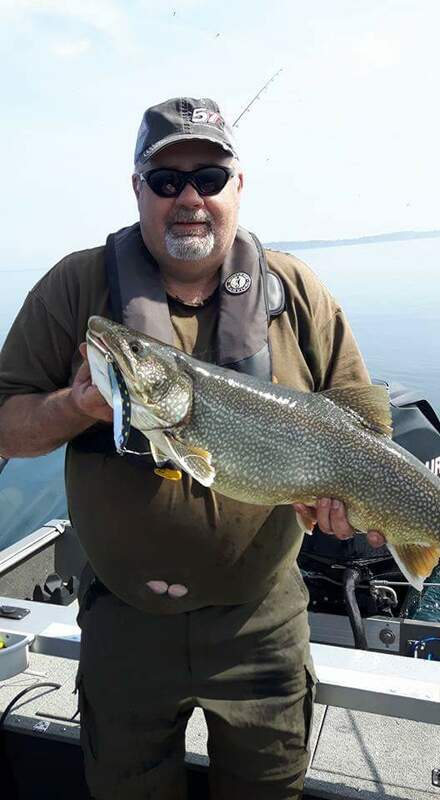 Over the next few day’s I was on the water daily, Guiding some outstanding fellas from Wisconsin. For the first 2 days, the fishing was outstanding, hitting over 35 Bass landed and around 15 pike on both days. My clients seemed super excited when both of them on each of their trips with me while fishing for some walleye in the later part of the afternoon, had the privilege of being able to have the feeling of what it feels like to have a very large musky on the end of their lines. 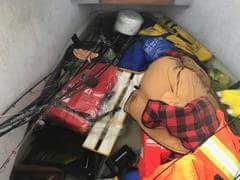 It was a good thing neither of them had actually landed the beastly fish as the musky are not actually in season as of yet. 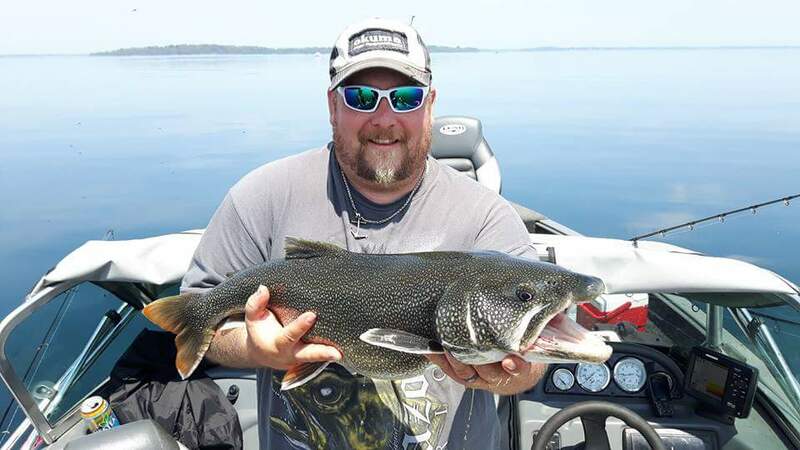 On their 3rd day of guided trips, the same Wisconson clients wanted to go to a back lake to try their hand at some lake trout. 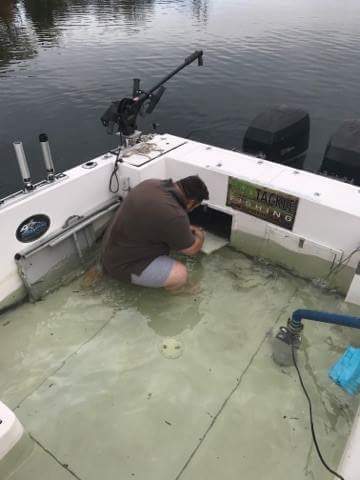 I mentioned that they may wish for a 2nd guide for the back lakes as the boats on those Lakes are a bit on the small side and wanted them to be as comfortable as possible. Sammy, (our 2nd guide) was out with the group for this next adventure. We decided to hike into a lake called Bluff Point. 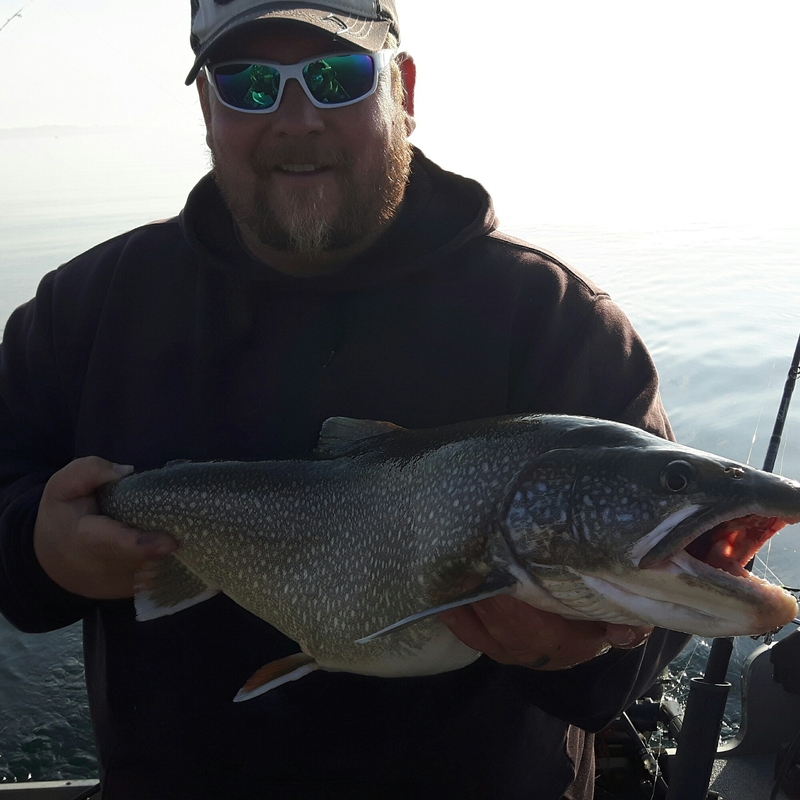 Bluff Point is definitely known for its lake trout fishery and the clients soon found out just how good it was. 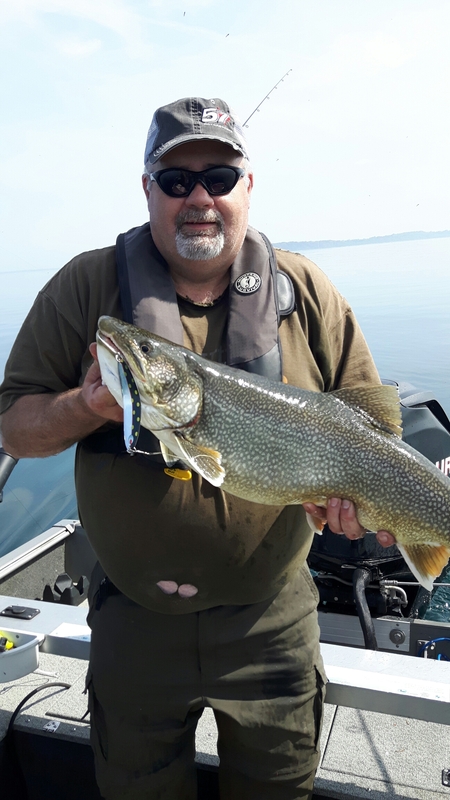 Sammy hooked into over 10 lakers, 3 or 4 Pike and a few Bass in 2.5 hours and I had around the same number of Bass and Pike but a few less Lakers than Sammy. The competition was fierce in the morning between the 2 boats before a great packed lunch on a majestic island in the middle of the lake. After lunch, everyone had decided to pack it in to get to another lake to try our hand at some more bass fishing. I myself made up for the friendly competition loss in the morning by getting over 25 Bass in the afternoon. once again the clients seemed very happy with the result of their trip and I manage to get myself some great rest before tomorrow’s next fishing adventure. I hope you have enjoyed this little story about fishing here at Slippery Winds this past week and stay tuned, I will tell the stories of my fishing adventures here at Slippery winds throughout this 2017 season. I am reaching out to my friends, family, and people I have on my contact list that I have not spoken to in a while. In an attempt to try and get support with a project I am working on this year. Before you read further into this e-mail, you should know, I am looking to raise money for a charity called ( Feed My Starving Children). OK now that we have gotten rid of the folk that are not interested in helping to feed starving kids , lets move on LOL. I am not sure if you are aware of the project I am getting involved with yet so I am writing this to fill you in. 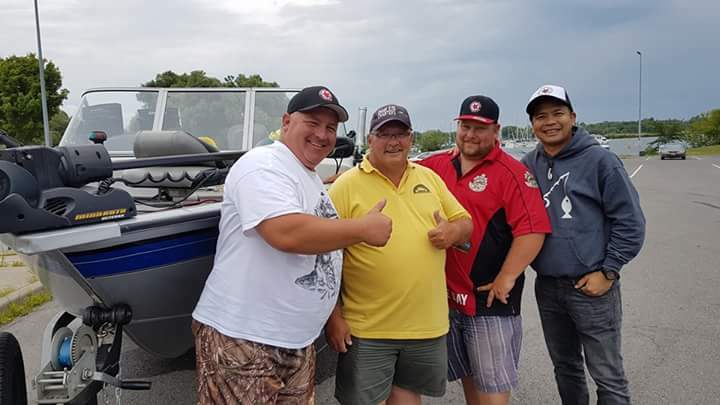 I have Partnered up with CFN ( Canadian Fishing Network) this season to help raise money for an incredible charity. I believe WE have come up with a unique way to involve the fishing community across the entire country. Although this is designed to involve the fishing community Canada wide, It does not exclude anyone to help out. Also if anyone feels they could contribute in any other ways not suggested below please feel free to message me your thoughts, and ideas. As to the details of to what is happening and I’ll try to be brief ( Although if you know my writing style, then you know this won’t be brief) LOL. Basically it’s like this. In Celebration of Canada’s 150th Anniversary this year, CFN and myself came up with an idea on how we would like to Celebrate. The idea is as follows, in conjunction with Angling For Life, (another social media fishing group) we are trying to raise money for charity, the charity is called “Feed My Starving Children“. This charity has, in over 70 Countries world wide, helped to feed starving kids that are MOST in need, & again this is “world wide“. 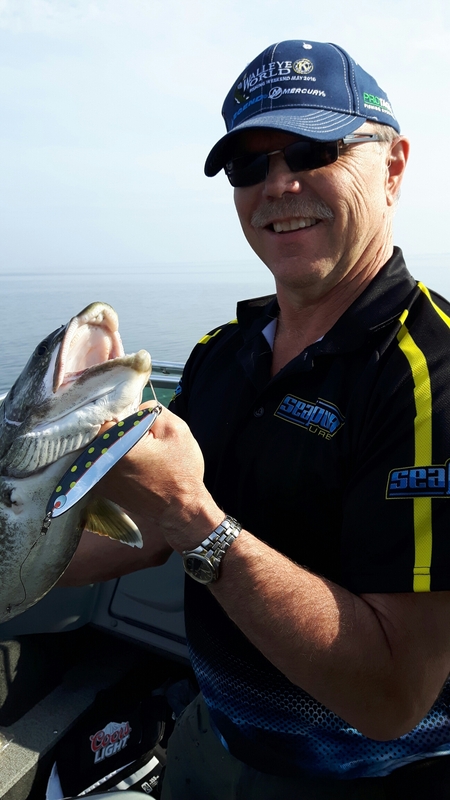 So we are reaching out across Canada to all Anglers, that wish to showcase their favorite fishing experiences through CFN. and anyone willing to help out, here is how it will work. The hope is to have people gain an awareness of of the charity and hopefully get them involved. 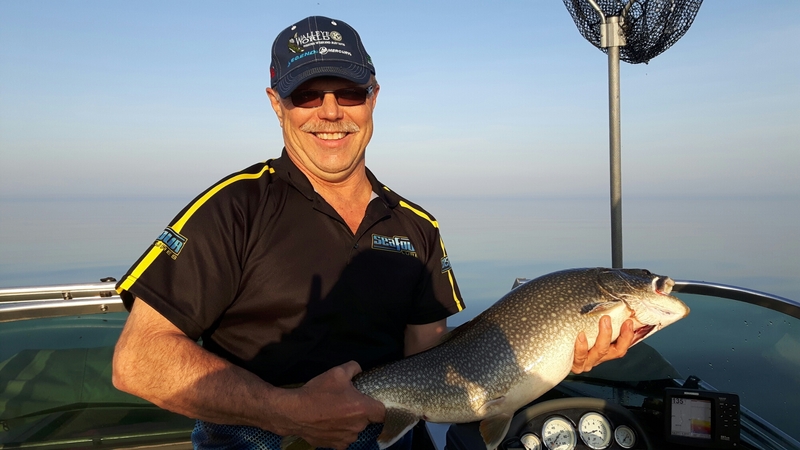 As well as showcasing some of Canada’s amazing fishing opportunities, and of course the vast landscape this incredible country has. 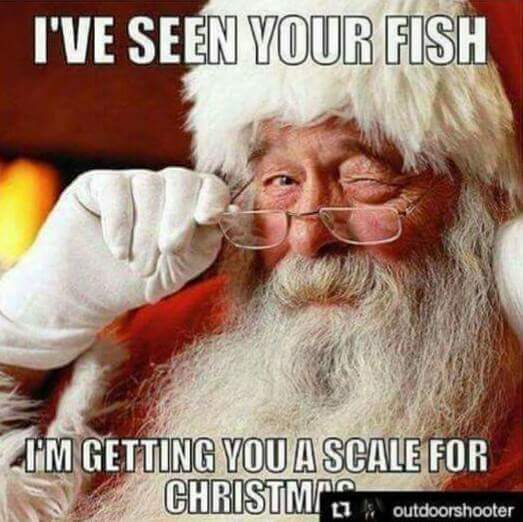 Of course we can’t get to everyone throughout the country, so we are hand picking out some of the fisherman/woman and trying to fit them in to my schedule or time frame. People that are interested in getting showcased need to send me a story about what their opportunity is, and why they would like to be featured. They must like both CFN’s Facebook page and my Sea’s The Day Fishing Adventures Facebook page in order to qualify. We are not necessarily looking for the best or most luxurious places, because that is not what CFN is about. CFN is about the everyday angler, the weekend Warrior’s, professional anglers alike, its about CPR ( Catch, Photo, Release), and conservation, And it’s about the passion of the Canadian fisherman and women of this country. So in the hopes of raising money, CFN will be holding an auction throughout the summer where we have already received some amazing donations form our sponsors, from products and or services, to volunteering, to cash donations. Everyone can help by donating, Money. Or services or products to our online auction. I am not asking for much by the way. Just so you are aware, just $1.00 helps a great deal. If you wish to help by donating services, or product then please get a hold of me through e-mail or you can call me at 1-343-333-2800 to discuss. or maybe you have a great place you would like to have featured along my journey. Again get a hold of me to discuss. In the hopes of getting anglers together Nationwide, and showcasing fishing opportunities through CFN, and with an auction with the help of our sponsors, we hope to raise money for A great charity (Feed My Starving Children), and showcase fishing opportunities, and this incredible country’s vast landscape, and this is how CFN and myself would like to Celebrate Canada’s 150th anniversary. Filming of this project has already started. we have filmed 2 episodes already and we plan on doing approx 34 separate locations throughout the country, between now and the end of October 2017. If you so choose you will be able to watch these episodes weekly starting by mid may 2017. on CFN facebook page at the following address. All of our sponsors will be mentioned often throughout the journey as often as we can. We will be tagging sponsors in as many posts as we can throughout many social media platforms weekly if not daily. I figured why not start right now. I would encourage everyone to have a look at the following sponsors and see the type of people that care about this great cause. here are the sponsors facebook pages, and/or websites, we currently have on board at the moment. 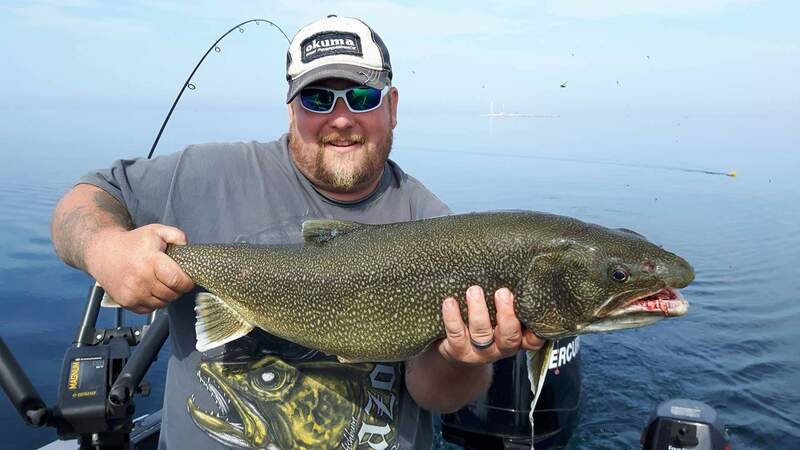 Sea’s The Day Fishing Adventures, https://fishingquinte.com/ we have a bunch more that have said they will be contributing to the cause as well shortly. exposure through this venture will be incredible. I hope you find yourself able to contribute in any way you can. If you think you would like to help with this cause then please message me back and we can discuss how you think you would like to help out.